I owe Victor Steinmann a great deal of gratitude for steering me towards populations of this plant. When I wrote my taxonomic revision of Ruellia section Chiropterophila, this amazing species was known from only one collection. Just as the page proofs for my manuscript were coming in, I received word from Victor of his discovery of a second population. Fortunately, I was able to include this information in that publication (Tripp 2010, Systematic Botany). Since that time, I’ve had the fortune of seeing this species in the wild myself, on a trip with Carrie Kiel and Kristen Hasenstab-Lehman, quite late in the day, with the sun quickly fading. True to the clade, flowers of R. sarukhaniana start to open at dusk, and shortly thereafter, anthers dehisce. Most likely another one of these “I want to be bat pollinated but for now I’m stuck with hummingbirds” plants. 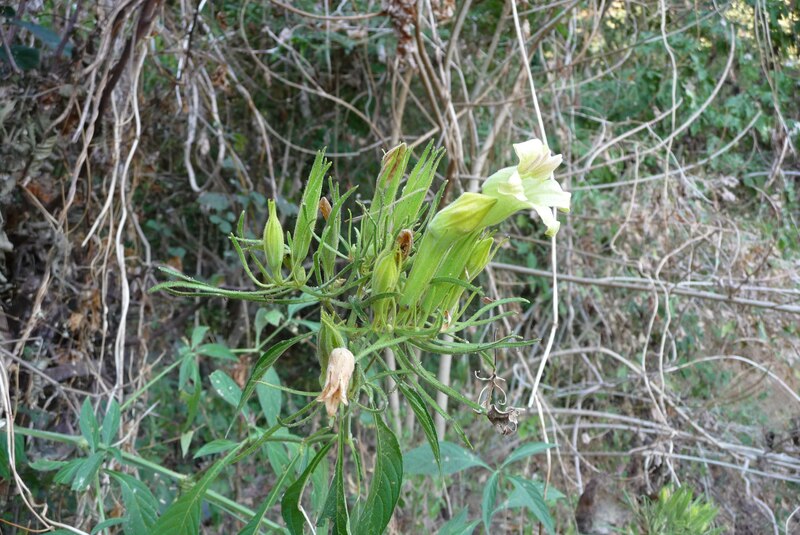 Ruellia sarukhaniana is locally endemic to a small portion of the Sierra Madre del Sur of Mexico. Based on the highly branching, narrowly linear / near fimbriate inflorescence bracts, it is closest relative should be R. jaliscana, but better / more suitable molecular markers are needed to sort this out. It is distinguishable from the latter by its narrow leaves.